Atlantic striped bass have formed the basis of one of the most important fisheries on the Atlantic coast for centuries. Early records recount their abundance as being so great at one time they were used to fertilize fields. However, overfishing and poor environmental conditions lead to the collapse of the fishery in the 1980s. The following recreational estimates is based on uncalibrated MRIP catch estimates: From 2007 to 2014, total recreational landings along the coast have averaged just over 25 million pounds annually. From 2015-2017, recreational anglers harvested an estimated 16 million fish annually, which can be attributed to implementation of more restrictive regulations via Addendum IV. Of those coastwide recreational landings, Maryland landed the largest percent in 2017 in terms of number of fish (52%), followed by Massachusetts (16%), New York (10%), New Jersey (8%), and Virginia (5%). Anglers continue to release the vast majority of striped bass they catch; 73% to 91% since implementation of Amendment 6 in 2003. The number of released fish peaked in 2006 at 23.3 million fish. Total numbers of releases have declined since then, averaging 8.6 million fish annually from 2008-2017. An estimated 12.0 million fish were caught and released in 2017. Under Amendment 5, commercial striped bass harvest grew from 3.4 million pounds in 1995 to 6 million pounds in 2002. Since the passage of Amendment 6, commercial harvest has been managed through a quota system, with landings averaging just shy of 7 million pounds annually from 2003 to 2014. In 2015, the commercial quota was reduced through Addendum IV. Chesapeake Bay jurisdictions accounted for approximately 62% (2.9 million pounds) of the total commercial landings in 2017 (4.8 million pounds). Other primary contributors to coastwide commercial landings in 2017 include Massachusetts (17%) and New York (15%). In 2017, commercial harvest in the Albemarle Sound/Roanoke River (A/R) management area was estimated at 75,783 pounds and recreational harvest estimated at 101,131 pounds. 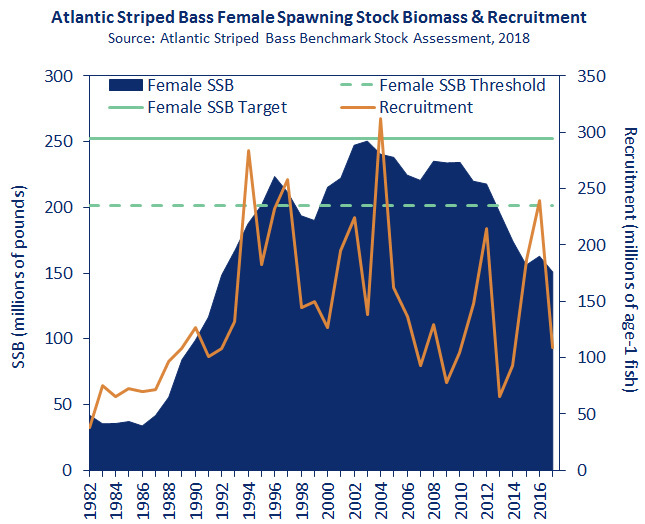 In February 2019, the Atlantic Striped Bass Management Board was presented the preliminary results of the 2018 benchmark stock assessment. The results of the assessment were preliminary since the final assessment, which was peer-reviewed through the Northeast Regional Stock Assessment Workshop/Stock Assessment Committee, had not been released due to the temporary partial shutdown of the federal government. The preliminary results indicate 2017 female spawning stock biomass was 151 million pounds, below the SSB threshold of 202 million pounds, indicating the stock is overfished. Fishing mortality (F) in 2017 was 0.307, above the F threshold, indicating the stock is experiencing overfishing. Following review, the Board discussed the need for adaptive management to end overfishing and increase female spawning stock biomass. The Board decided to wait to take management action (i.e., initiate the development of a plan amendment or addendum) until it can formally review and approve the final assessment and peer review panel reports for management use. In the interim, the Board requested additional information from the Technical Committee (TC) to better understand the extent of necessary action. Specifically, the TC was tasked with estimating levels of removals needed to reduce F to the F threshold and the F target, and to also provide an example recreational bag and size limit combination that would achieve those conditions on the coast and in the Chesapeake Bay. The TC will report back to the Board in May. 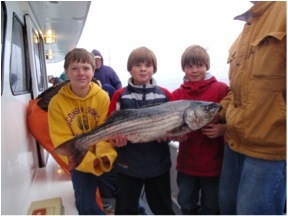 Young anglers with an Atlantic striped bass. Photo credit: Captain John Brackett of the Queen Mary. Atlantic striped bass is managed through Amendment 6 to the Interstate Fishery Management Plan for Atlantic Striped Bass (February 2003) and its subsequent addenda (Addendum I-IV). The management program includes target and threshold biological reference points and sets regulations aimed at achieving the targets. Required regulatory measures include recreational and commercial minimum size limits, recreational creel limits, and commercial quotas. States can implement alternative management measures that are deemed to be equivalent to the preferred measures in Amendment 6 through the conservation equivalency process. 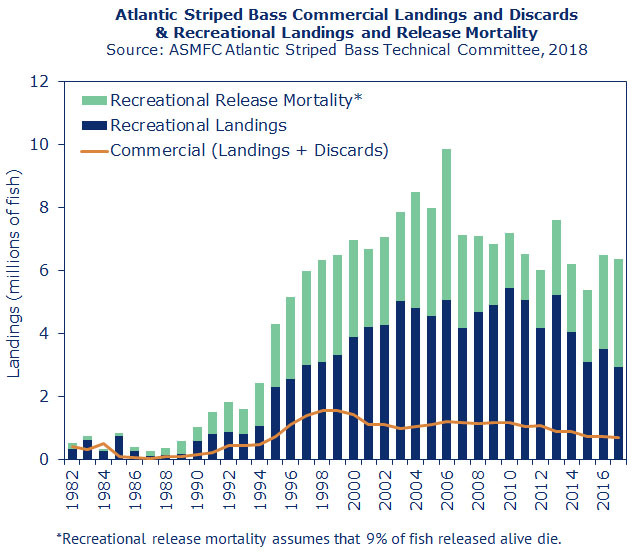 In response to the 2013 benchmark assessment results which indicated steady decline in SSB, the Atlantic Striped Bass Management Board approved Addendum IV in October 2014 to establish new fishing mortality reference points (F target and threshold). In order to reduce F to a level at or below the new target, the coastal states were required to implement a 25% harvest reduction from 2013 levels, while Chesapeake Bay states/jurisdictions were required to implement a 20.5% harvest reduction from 2012 levels. To reduce recreational harvest, states implemented a one fish bag limit while keeping a 28” size limit. Eight states and jurisdictions submitted conservation equivalency proposals for at least one of their fisheries (alternative measures that achieve the same reduction but are designed to meet the state’s fishery needs) which were approved by both the Technical Committee and Board. Based on the results of the 2016 Atlantic striped bass stock assessment, the implementation of Addendum IV successfully reduced F to a more sustainable level, though SSB is still in decline. Given the A/R striped bass stock contributes minimally to the coastwide complex when compared to the Chesapeake Bay, Delaware and Hudson stocks, Addendum IV deferred management of this stock to the State of North Carolina using Board-approved stock-specific biological reference points. These stock-specific reference points result in a separate quota set to maintain F for the (A/R) stock at its target level.